My SketchUp Plugins list, and blog about the world of plugins for SketchUp. This importer lets you import both ASCII and binary STL files into SketchUp. It automatically detects the type of .stl file and imports accordingly. To import a .stl file, go to the File > Import menu, and select STL Importer. Optionally press the Options button to select the units, then select the file to import. The STL Importer is free software licensed under the GPL. Download the attachment from below, and copy it to your SketchUp/Plugins folder. [ Download ] STL Importer. Anything in the works for exporting STL files out of Sketchup? The 3D printing guys like to work with STL files, so I thought I would ask. Thanks, Jim! I'll try this out today. I am having problems with file sizes with this plugin. I work in mm and when I import stl it thinks its inches and it makes the file huge. Any suggestions? any hints on how to resolve this? When you the file browser opens, and before you select the file, there is an "Options" button that will let you select the units to use for the import. I have tried to use your importer on some Tom Dixon .stl files, however the importer seems not to recognize the format. The importer works fine for the examples you link to. The tom dixon files do look as binary files. Any Idea? is it possible to import a whole folder of STL-files? --> I have a drawing with about 100 STL-components. What would you suggest? How could I import this files into SketchUp? Your STL Importer is excellent! I tried to use add_face to write my own plugin for STL importing. However the speed was terrible, not mention to Sketchup stopped responding before the ruby script finished. Hi everyone! I'm still trying to transform a Sketchup File in .STL... And it still not working. I try with guitar-list.com but i have a Mac, is it different? Hello, I downloaded this Plugin for importing .stl files to Sketchup, and have CADspan to export them from Sketchup. I am having a hard time downloading the .stl files from the linked websites. When I click on the link, I am redirected to .html text, and not a file download. Perhaps I don't understand the .stl file format. I have a Mac. Help! @Hope - right-click the links, then select "Save as" or "Save link as." Jim, I'd like to report a bug. I'm Brazilian, and we commonly use the character: "ç" in our words. The bug is that if I try to open a STL file in a folder named, for example, "ç", nothing happens and the sketchup doesn't import anything. Thank you so much for this awesome importer tool. You've saved me a ton of time. The file sizes on the skp files after import are massive. Do you have a suggestion to reduce it? Can I convert the object reduce the triangles? Sketchup is freeze and do not answer any more. I can open the file in MeshLab. Models from http://www.thingiverse.com/thing:32465 did not import at all. Still I can open them in Slic3r and MeshLab. But anyway, thanks for the good work. 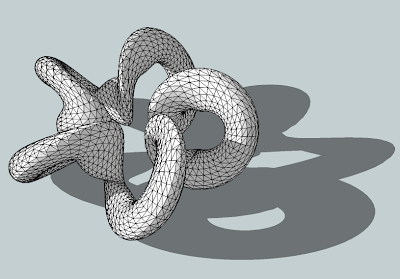 bpetto - my stl importer is now part of SketchUp and is available here. Both files from Thingiverse import without trouble for me. ASCII STL import appears to work without any errors. BUT - nothing is displayed. Tried zooming out and scaling but nothing worked. HELP ! Would love to have this plugin but the link is dead. I use SketchUp 7 and 2014. Smustard - More free and fee plug-ins for SketchUp. SketchUcation Forums - The friendly community of SketchUp fanatics. SketchUp Sage - comprehensive resource lists.